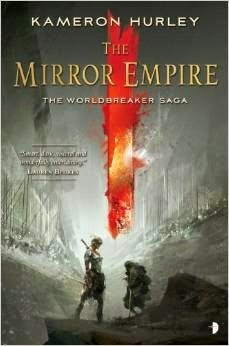 Here are some highlights from my conversation with Kameron Hurley, author of The Mirror Empire, on New Books in Science Fiction. Although her first book was a success (winning the Sydney J. Bounds Award for Best Newcomer and the Kitschy Award for Best Debut Novel), the other two books in the series, Infidel and Rapture, were hurt by the financial troubles of the publisher. Hurley rallied, finding a new agent and a new publisher, but the path wasn’t easy. As she says, “You’re only as good as your last book. If your last book doesn’t sell, then you’re not going to sell other work. … This is an up and down business. It’s not a straight trajectory. You have to work very hard, and I think that’s very motivating for me to know I have to work very hard just to stay in the game.”While writing is a solitary affair, Hurley has surrounded herself with a circle of supporters—and advises everyone to do the same. “If you’re going to have a goal in life… You want to be a CEO, you want to open your own business, you want to be a writer [then] you need to surround yourself with people who support what you are doing. And that’s everyone. If your family doesn’t support what you do then maybe don’t see them as much. I hate to say it. And if you have a partner who doesn’t support what you do, then maybe you should look at a different partner. If the agent that you have is not working out and your styles just do not work and you’re not getting what you need from that relationship then you need to find an agent that works.”Check out Hurley’s essay “We Have Always Fought”—about the history of women in conflict—which was the first blog post ever to win a Hugo Award.